Morocco's Raja Casablanca earned an vital away win in Congo Brazzaville over CARA in the first leg of their African Champions League quarter-final on Sunday. Nigeria's Enyimba managed a goalless draw in Rwanda against Rayon Sports. AS Vita Club of DR Congo were the big winners with a 3-1 victory over Moroccan side Renaissance Berkane. Egypt's Al Masry will take a slender 1-0 advantage for next Sunday's second leg in Algeria against USM Alger. Raja had the tournament's top goal scorer, Mahmoud Benhalib, to thank for their victory as he scored the winner over CARA in Brazzaville. It took his season goal tally in the Confederation Cup to 11 goals, four less than record-holder Algerian Abdelmalek Ziaya for Entente Setif during the 2009 season. Benhalib came off the bench on the hour mark and scored the winner with 10 minutes remaining to inflict a first home loss on CARA in the competition this season. 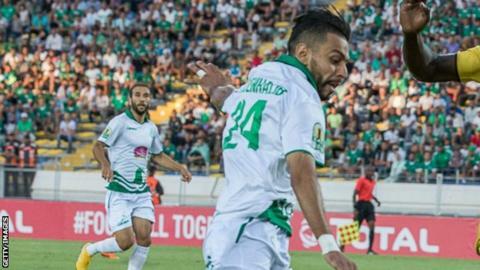 Soufiane Rahimi put three-time African champions Raja ahead on 47 minutes and Cabwey Kivutuka equalised after 71 minutes. CARA had been strong at home and weak away en route to the last-eight phase, winning their previous six matches in Congo and losing all six away games. Jean-Marc Makusu, the closest challenger to Benhalib for the Confederation Cup Golden Boot, raised his campaign total to nine with a brace for AS Vita Club. His goals helped his side recover from conceding the first goal of the match to defeat Renaissance Berkane 3-1 in Kinshasa. Goal-scoring full-back Mohammed Aziz got his third of the campaign for Berkane on 24 minutes before Makusu made his presence felt. He equalised just before half-time, scored again 12 minutes into the second half and Djuma Shabani claimed the third Congolese goal with 78 minutes gone. Enyimba goalkeeper Theophilus Afelokhai continued his superb Confederation Cup form to thwart Rayon Sports of Rwanda in a 0-0 Kigali stalemate. Al Masry stretched an unbeaten Caf run to 11 matches by edging USM Alger 1-0 in Port Said thanks to a 54th-minute goal from Mahmoud Wadi. The club coached by Egyptian legend Hossam Hassan have suffered only one loss in 13 matches, away to Green Buffaloes of Zambia in a preliminary round qualifier last February.